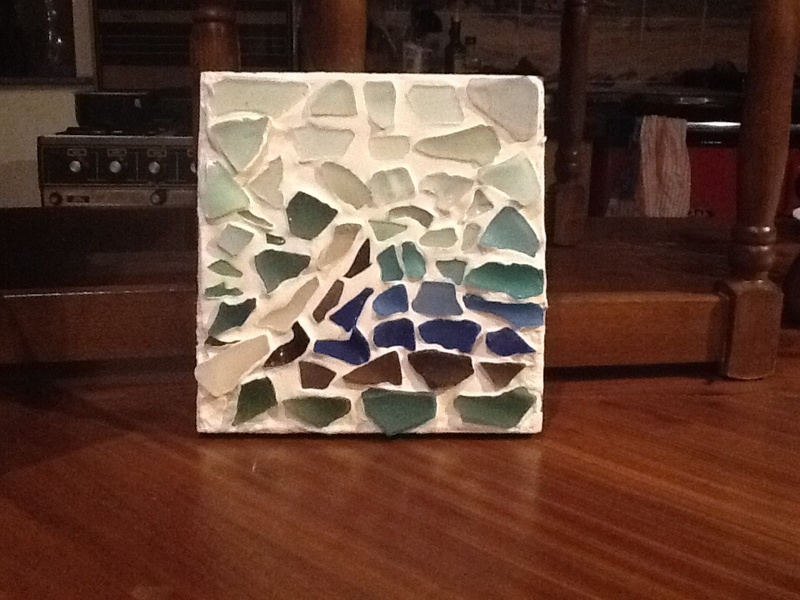 I have taken up a hobby of making mosaics from broken pieces of glass and pottery. One sunny morning in Springtime I went for a walk along the foreshore. It is a stony beach. I noticed pieces of green glass glistening among the pebbles. They were looking at me inviting me to pick them up. I picked one up, then another, and another until my pocket was full. I felt like I was panning for gold in the stones of the shoreline. Brendan joined me is my treasure hunt and he collected a pocket full too. We collected other species, shades of blue, white, and brown. I inspected them all when I returned home. I asked myself what can I do with these colourful but broken pieces of glass. The edges weren’t sharp any more and their colours were cloudy from the years of being broken and worn with the sea storms. They had lost their shine. Circumstances in life bring troubles, disappointments, lose or rejection leaving one worn down with the storms of life or relegated to the ash heap. When washed and grim removed, my pieces of glass were ready to be positioned into something beautiful. As I looked at the different shapes of green pieces I was inspired to make a mosaic of my country, Ireland, which has thirty two counties. I would use a piece of glass for each county. I found a piece of wood and a tube full of tile filler. So started my hobby of making mosaics. I tried out putting other colours of glass together. I find I relax as I work. On Saturday I discovered a new site along the shoreline to build up my supply of broken pieces. I added to my collection, pieces of pottery. I was excited to see how these pieces would clean up. Some had blue willow patterns, some had plain colours. How would they fit in to a mosaic? As I worked I reminded myself how glass is made. It is made from the common material, sand. The sand is heated to 1700 degrees. Through the fire sand changes to become glass. Pottery is made from clay, a common material. The clay is treated in high temperatures to turn it to pottery. The Word of God tells us that we were created by God. When I go though the fires of difficulty I am being transformed to be a useful vessel for The Lord, like the sand being transformed to glass or the clay to pottery. The pieces of glass and pottery on the beach are all that remain of useful vessels. Perhaps the blue glass was a beautiful perfume bottle or the piece of pottery, a treasured piece of willow patterned delph on a bride’s dresser. But even after many years Our Creator God can reach down and touch all that remains of a broken vessel and make something new. My mosaics speak to me of hope. There is life after brokenness. They can be displayed on a dresser again or adorn a bathroom wall and be a thing of beauty again. God will restore lives again. Great blog post!! God makes beautiful things from brokenness! I am glad you are enjoying life on loughshore road, looking forward to joining you in a couple of weeks, we can go and collect treasure together. I am heading over to Glasgow today to get a crown from Morven, I had bought a ticket for the megabus, but didn’t have my student card so he didn’t let me on and said it would be £7.50! I was very discouraged. I was outside the train station so went in to get a ticket for the train and on the ticket machine there was a ticket for Glasgow from Edinburgh for today, so I got a ticket for the train for free! God is so faithful!